Click Here to Begin Slideshow Last issue, we took a detailed look at the different ways to actually build an aluminum radiator. We looked at the play on words (misinformation) used to promote extruded cooling tubes along with the technology used in roll form tubes. We also looked at “double” and “triple” pass radiators, along with the wording used to promote “four core” radiators. Something else you should ponder is if a rad company is actually a manufacturer or just an assembler. According to DeWitts, “When it comes to really building radiators in-house, not that many companies actually own an aluminum brazing furnace. Many companies claim to make aluminum radiators when in reality they just purchase the components and assemble radiators. Some companies may not make anything at all and just re-sell a brand made elsewhere. DeWitts owns their own aluminum-brazing furnace and they point out that aluminum brazing requires a very high volume of nitrogen gas. The bottom here is, if a radiator company does not have an industrial grade nitrogen yard (DeWitts operates a massive 3,000 gallon system), they do not make their own cores.” Fair enough. 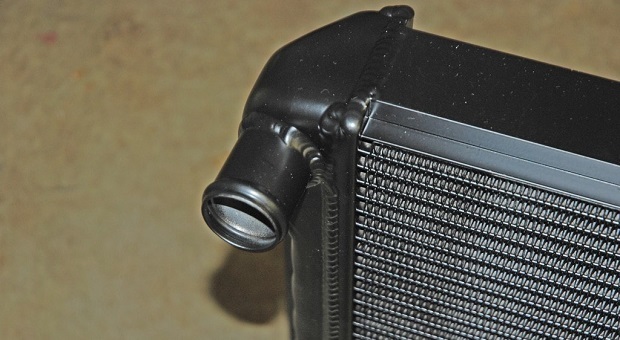 But there are some other technical considerations to ponder: Believe it or not, the shape and form of the radiator outlets might have a profound effect upon cooling. Now, we don’t have any concrete proof of this, but we’ve witnessed one particular car (a high horsepower 427 big block-powered example) that went through multiple radiators in an effort to resolve a cooling issue. The only (visible) external differences between the radiators were the shapes of the outlets. The rad that worked was built with formed outlets with soft bends. The others had fabricated outlets with sharp bends (virtually a series of 45-degree joints). The car consistently boiled over with the sharp-bend equipped rad. With no other changes (aside from the rad swap), the operating temperature was entirely satisfactory with the formed outlet radiator. The theory was that the sharp outlet corners actually restricted the coolant flow (perhaps more than we knew) and most likely had a serious effect upon laminar flow. Check out the outlets on the DeWitts radiator in the photo above. They match the shape, size and location of the stock radiator. That means you can use stock hoses, and there’s no funny business with flow restrictions. There might be more here, too: Typically a formed radiator hose (the type Detroit always uses on their vehicles) will deliver superior performance to one of those universal “fits-all” ribbed hoses that are available at the local discount auto parts stores. The belief is that there is considerable laminar flow in the hose, and the ribs of the universal radiator hose disturb this flow. So what’s the answer? Simple. Watch out for cheap, universal hoses, and be careful when selecting a rad – smooth outlet bend radius are likely much more efficient than sharp, angular turns. What if you want a radiator that looks close to stock? That’s where the folks from DeWitts can help you out. Virtually all of their replacement radiators are built with OEM-appearing tanks (although they are obviously built from aluminum). Case-in-point is the radiator shown in the accompanying photos. 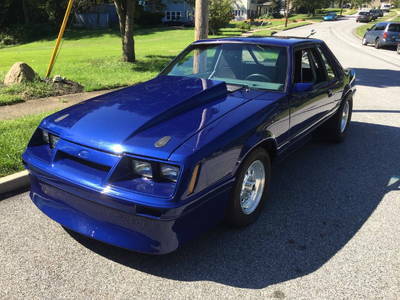 It not only looks like a stock style rad for a first generation big block Camaro (or 1968-70 big block Nova), it also has dimensions similar to a stock rad and it accepts a stock or exact reproduction fan shroud. The radiator even has built-in clips to hold the shroud in place. Obviously, DeWitts can supply radiators such as this with an electric fan setup too. 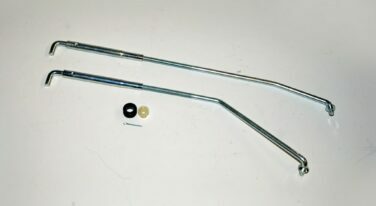 Radiators for Tri-Five applications and select early Corvette examples make use of a single 16-inch electric, while most of the cross flow examples for later model cars incorporate dual fans (usually 11-inch or 12-inch examples). The fans are all top-of-the-line Spal components (they even offer brushless motor fans as an option). Most of the fan and shroud kits can be retrofit to existing DeWitts radiators too. For the LS swap crowd, DeWitts has a wide range of available rads. For example, they offer rads for LS-swapped Tri-Five Chevys, X-frame Chevys, Chevelles, Camaros, Novas, Corvettes and even C10’s. You’ll find that each application bolts in place using the system with which your particular car was designed. 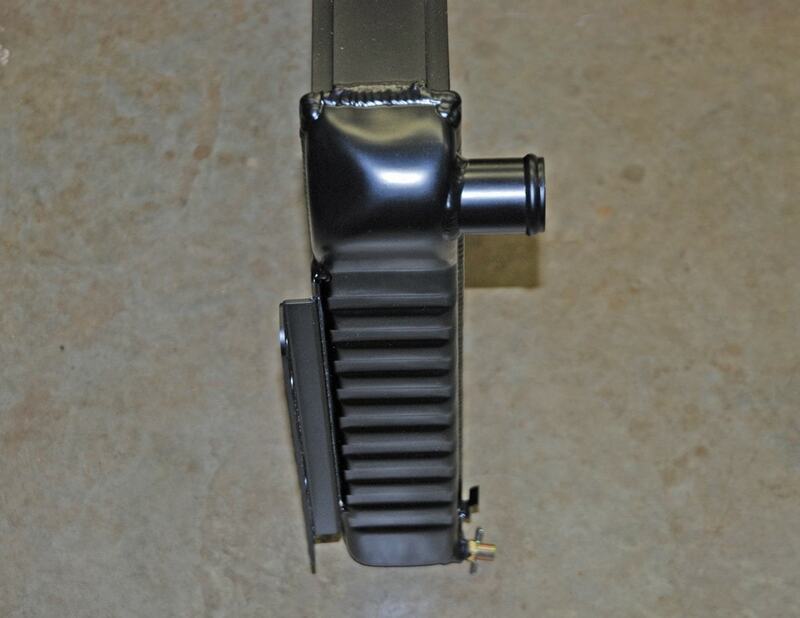 Many applications use a lower saddle mount to support the radiator and isolate it from vibration. Others make use of side mounts. Here, the radiator is bolted to the radiator support by way of two to four rubber cushion well-nut mounts. One more option you might want to consider for a stock appearing rad is DeWitts’ “Black Ice” coating. It is a semi-gloss black coating that gives your aluminum rad the look of a vintage copper-brass example. This is a two-part epoxy paint engineered to adhere to aluminum radiators. You can have it applied to a new rad or you can apply it yourself. It is applied by way of an air type spray gun and only one or two coats are necessary. It cures in approximately 12 hours and as the solvents evaporate, the product shrinks to provide a very thin, 0.002-inch film. DeWitts notes that this thin skin will protect the aluminum without having any adverse effects upon heat transfer (keep that in mind when painting any radiator). Another question that regularly pops up when dealing with radiators is capacity. We asked DeWitts about the volume of coolant their typical radiators hold: “Most cars produced prior to 1983 used three or four row copper radiator cores with large brass tanks. In this case, our radiators hold the same volume as the factory unit. Cars produced after 1983 were equipped with a single row aluminum radiator with plastic end tanks. For these applications, our double row aluminum radiators will hold one (1) additional gallon over the factory unit.” The pressure cap is important, but some folks get it wrong when it comes to rad caps. Here’s why: Recall when we talked in the first segment about pressurizing the cooling system? Pressurizing the cooling system raises the boiling point of the coolant 3 degrees for every one pound of pressure. DeWitts notes this does not have anything to do with how your cooling system will perform. It only sets the point at which your coolant will boil. A coolant mixture of 50/50 (water/antifreeze-coolant) has a boiling point of 238 degrees. Pressurizing the system 15 psi will change that point to 283 degrees, but it will not change the coolant running temperature. Pressure caps are available with ratings of 7-20 psi, and any cap in that range would work. As a result, DeWitts recommends you use a cap in the 13-15 psi range. More on DeWitts pressure caps in the accompanying photos. What about coolant? What coolant is recommended for an aluminum radiator? According to DeWitts: “Actually, the quality of the water you use is more important than the brand of coolant. Aluminum is very sensitive to minerals and chemicals in all sources of water, and only distilled water should be used. We recommend that you purchase a "pre-mixed" extended life coolant of your choice. This eliminates any chance of using the wrong source of water and simplifies the process of mixing, filling and adding coolant.” As you can easily see, there is whole bunch more to modern aluminum radiators than first meets the eye. If the rad is expertly manufactured, it will actually prove to be filled with (extremely) high tech features. For a closer look, check out the accompanying photos. With proper selection, these rads will keep your racecar or modified street car cool during the dog days of summer. Last issue, we took a detailed look at the different ways to actually build an aluminum radiator. We looked at the play on words (misinformation) used to promote extruded cooling tubes along with the technology used in roll form tubes. We also looked at “double” and “triple” pass radiators, along with the wording used to promote “four core” radiators. Something else you should ponder is if a rad company is actually a manufacturer or just an assembler. Fair enough. But there are some other technical considerations to ponder: Believe it or not, the shape and form of the radiator outlets might have a profound effect upon cooling. 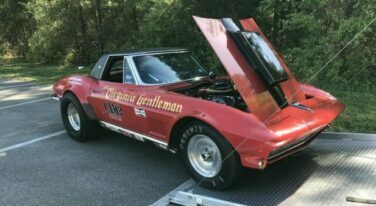 Now, we don’t have any concrete proof of this, but we’ve witnessed one particular car (a high horsepower 427 big block-powered example) that went through multiple radiators in an effort to resolve a cooling issue. The only (visible) external differences between the radiators were the shapes of the outlets. The rad that worked was built with formed outlets with soft bends. The others had fabricated outlets with sharp bends (virtually a series of 45-degree joints). The car consistently boiled over with the sharp-bend equipped rad. With no other changes (aside from the rad swap), the operating temperature was entirely satisfactory with the formed outlet radiator. The theory was that the sharp outlet corners actually restricted the coolant flow (perhaps more than we knew) and most likely had a serious effect upon laminar flow. Check out the outlets on the DeWitts radiator in the photo above. They match the shape, size and location of the stock radiator. That means you can use stock hoses, and there’s no funny business with flow restrictions. There might be more here, too: Typically a formed radiator hose (the type Detroit always uses on their vehicles) will deliver superior performance to one of those universal “fits-all” ribbed hoses that are available at the local discount auto parts stores. The belief is that there is considerable laminar flow in the hose, and the ribs of the universal radiator hose disturb this flow. So what’s the answer? Simple. 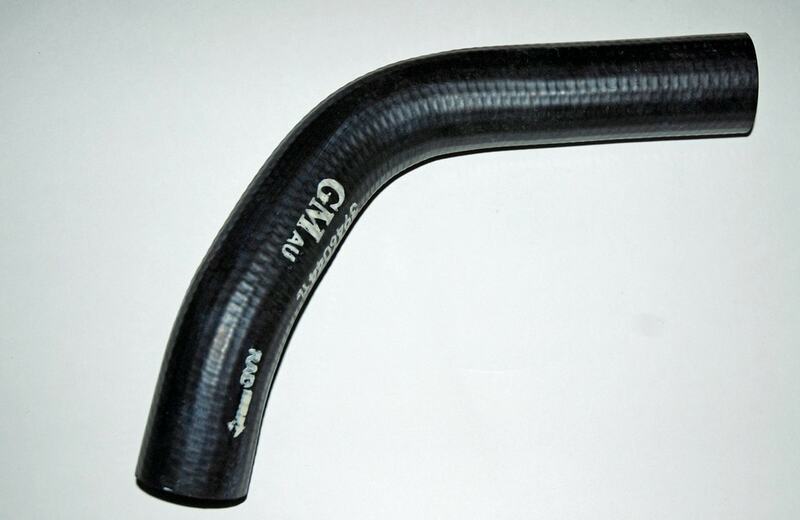 Watch out for cheap, universal hoses, and be careful when selecting a rad – smooth outlet bend radius are likely much more efficient than sharp, angular turns. What if you want a radiator that looks close to stock? That’s where the folks from DeWitts can help you out. Virtually all of their replacement radiators are built with OEM-appearing tanks (although they are obviously built from aluminum). Case-in-point is the radiator shown in the accompanying photos. 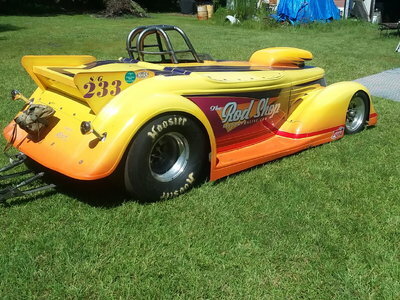 It not only looks like a stock style rad for a first generation big block Camaro (or 1968-70 big block Nova), it also has dimensions similar to a stock rad and it accepts a stock or exact reproduction fan shroud. The radiator even has built-in clips to hold the shroud in place. Obviously, DeWitts can supply radiators such as this with an electric fan setup too. 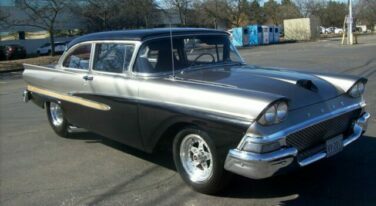 Radiators for Tri-Five applications and select early Corvette examples make use of a single 16-inch electric, while most of the cross flow examples for later model cars incorporate dual fans (usually 11-inch or 12-inch examples). The fans are all top-of-the-line Spal components (they even offer brushless motor fans as an option). 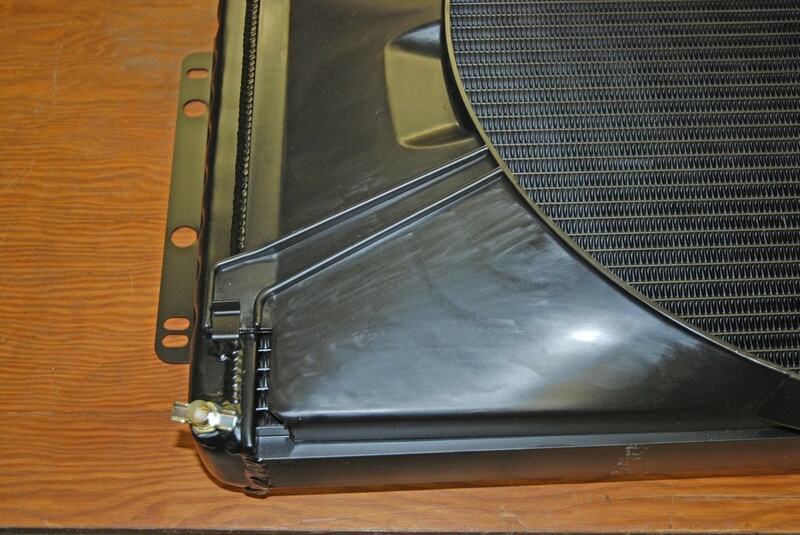 Most of the fan and shroud kits can be retrofit to existing DeWitts radiators too. For the LS swap crowd, DeWitts has a wide range of available rads. For example, they offer rads for LS-swapped Tri-Five Chevys, X-frame Chevys, Chevelles, Camaros, Novas, Corvettes and even C10’s. You’ll find that each application bolts in place using the system with which your particular car was designed. 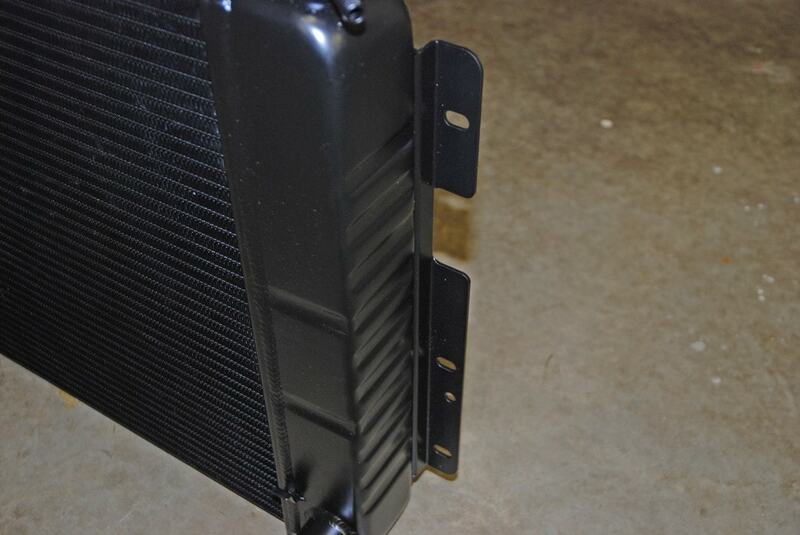 Many applications use a lower saddle mount to support the radiator and isolate it from vibration. Others make use of side mounts. Here, the radiator is bolted to the radiator support by way of two to four rubber cushion well-nut mounts. One more option you might want to consider for a stock appearing rad is DeWitts’ “Black Ice” coating. It is a semi-gloss black coating that gives your aluminum rad the look of a vintage copper-brass example. This is a two-part epoxy paint engineered to adhere to aluminum radiators. You can have it applied to a new rad or you can apply it yourself. It is applied by way of an air type spray gun and only one or two coats are necessary. It cures in approximately 12 hours and as the solvents evaporate, the product shrinks to provide a very thin, 0.002-inch film. DeWitts notes that this thin skin will protect the aluminum without having any adverse effects upon heat transfer (keep that in mind when painting any radiator). The pressure cap is important, but some folks get it wrong when it comes to rad caps. Here’s why: Recall when we talked in the first segment about pressurizing the cooling system? Pressurizing the cooling system raises the boiling point of the coolant 3 degrees for every one pound of pressure. DeWitts notes this does not have anything to do with how your cooling system will perform. It only sets the point at which your coolant will boil. A coolant mixture of 50/50 (water/antifreeze-coolant) has a boiling point of 238 degrees. Pressurizing the system 15 psi will change that point to 283 degrees, but it will not change the coolant running temperature. 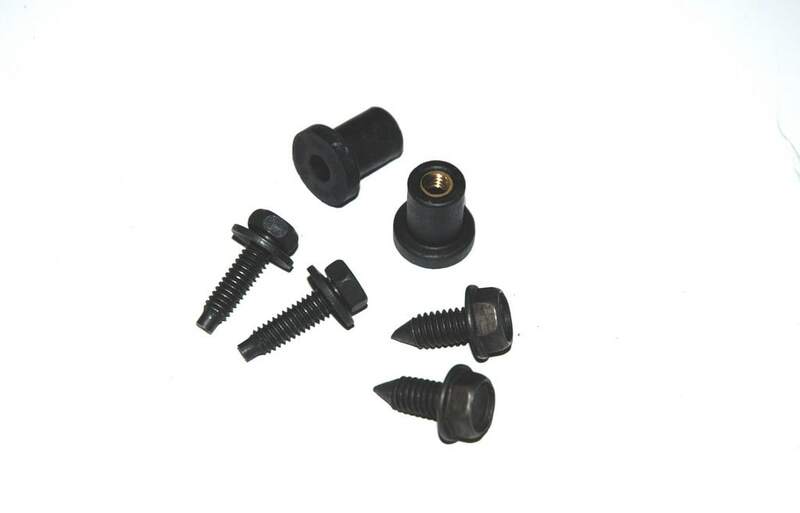 Pressure caps are available with ratings of 7-20 psi, and any cap in that range would work. As a result, DeWitts recommends you use a cap in the 13-15 psi range. More on DeWitts pressure caps in the accompanying photos. As you can easily see, there is whole bunch more to modern aluminum radiators than first meets the eye. If the rad is expertly manufactured, it will actually prove to be filled with (extremely) high tech features. For a closer look, check out the accompanying photos. 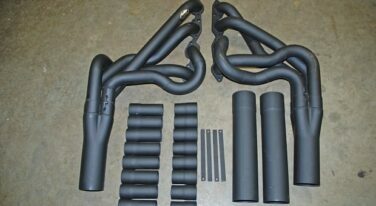 With proper selection, these rads will keep your racecar or modified street car cool during the dog days of summer. Note the formed end tanks used on the DeWitts radiators. They’re very similar to the stock tanks used on the copper-brass radiators these custom aluminum jobs are meant to replace. The direct replacement rads from DeWitts are designed to use the same mounting arrangement as the rads they replace. As a result, the mount brackets replicate the originals (but they’re in aluminum). While DeWitts offers a number of different electric fan options, they can configure your rad to accept a stock or stock style fan shroud. The shroud mount clips are built right in. 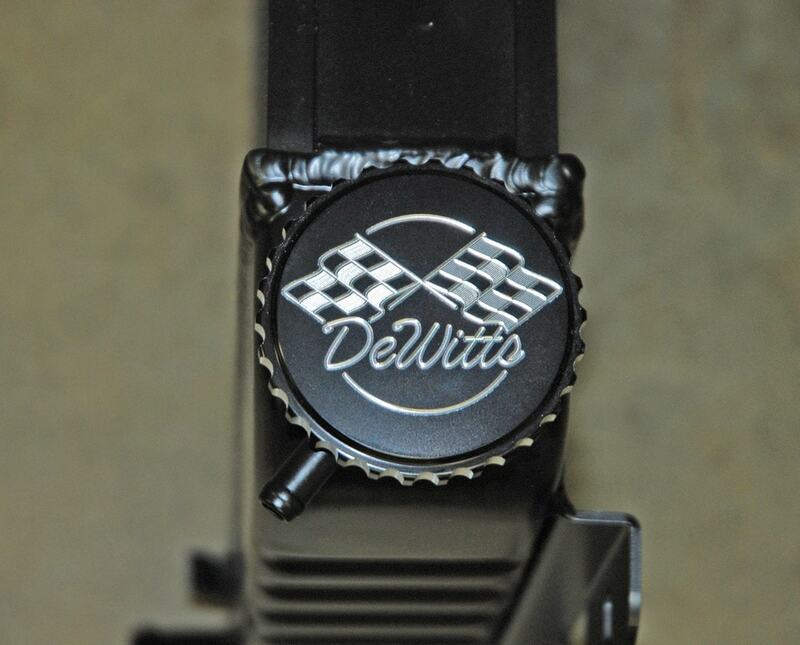 Here’s a look at the cool billet pressure cap cover used on the DeWitts radiator. This is a 15-PSI cap.